Are you looking out for the ways to reduce your aging signs without undergoing a surgical procedure? We all know that looking better in our late thirties or forties requires a little more effort than it did in our twenties or early thirties. If you are worried about your nagging flaws and want to fix them but are afraid of undergoing the knife, then the advanced cosmetology brings you the wide and modern options to treat your sagged or droopy face with non-surgical skin tightening treatments. Now, it’s time to turn back your time and enjoy the wrinkle free and flawless skin. ULTRAcel is used for redefining your facial contours and for improving the quality of your skin without the downtime associated with surgical procedures. ULTRAcel involves a device that never breaches your skin instead of it, the handheld devices of this skin lifting machine moves over your skin gently emitting radio frequency or ultrasound waves in the form of heat energy. In 2015, ULTRAcel was launched which offers the patients an even more efficient way of non-surgical skin tightening. How ULTRAcel gives the ultra-lift to your skin? ULTRAcel uses the 3 different skin lifting technologies in a single skin tightening procedure which can be used in combination or even as standalone skin uplifting treatments. During the treatment, warm waves of ultrasound energy are transferred deep under the skin which causes the muscular layer of epidermis to contract. This transferred heat energy stimulates the skin regeneration and rejuvenation process. This will encourage the collagen and elastin production in your body which will give you much firmer, brighter and tighter skin. ULTRAcel targets all the layers of the skin. 1st Step-Grid RF: Grid RF transfers the radio frequency and high intensity focused ultrasound waves in the upper dermis which are emitted to 3.0/4.5 mm depth with the fractional shape. It encourages the collagen production and smoothens the skin surface. 2nd RF Micro-needling: RF Micro-needling uses the small insulated micro-needles which create tiny wounds by penetrating into the dermal layer of skin. When this micro-needling technique is combined with RF, it enables the thermal energy to stimulate the body’s natural healing mechanism which enhances the collagen production. HIFU/FUS: In HIFU, the high intensity of ultrasound waves are emitted to the deep structural layers such as fascia, SMAS fat layer which causes thermal wounds, stimulating the body to launch its natural healing mechanism. As a result of which skin starts to produce more collagen, which lifts, tightens and contours the skin. Those who do not want to undergo a surgical procedure for face uplifting but are looking for the ways to improve skin laxity. You must have mild to moderate amount of soft skin tissue laxity. 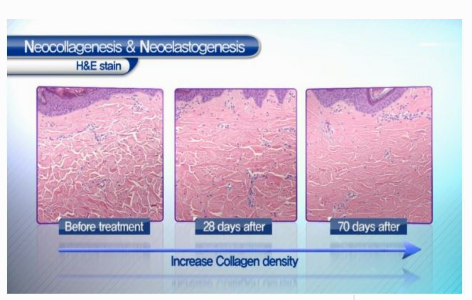 If you are a chain smoker or have excessive photo aging, then you are not a suitable candidate for ULTRAcel as you may have inadequate ability to regenerate collagen. However, you may consult a doctor and can get a consultation for your treatment. If you have severe aging or wrinkles, then your results may be impaired as you may have lost the ability of collagen to shorten. Before going for the treatment, it is important that you must have realistic expectations regarding the results of your treatment. As, clinical improvements often are more restrained disparate surgical procedures. ULTRAcel is known to provide clinically proven results in skin uplifting and tightening. Various clinical trials have shown that there is an increase in the collagen production and your skin starts looking tighter and firmer instead of saggy or drooped. However, these results may vary from patient to patient and depending upon the skin condition. But once, you have undergone the full treatment as recommended by your dermatologist, you will continue to see the improvement in skin up to 3 months. So, get ready to give a glossy, fresh, lifted and smooth effect to your skin with ULTRAcel-A revolutionary skin rejuvenation treatment. Author Bio: Dr. Aman Dua, MBBS MD, skilled dermatologist & hair transplant surgeon and co-founder of AKClinics. She had practiced both medical and dermatology for years. Exceptionally talented at treating skin conditions require laser therapy such as acne, scars, wrinkles, pigmentations or other treatments like facelift, chemical peels and anti-aging treatments. extra articles. You, my pal, ROCK! I found simply the information I already searched all over the place and simply couldn't come across. someday. I want to encourage that you continue your great job, have a nice morning! There are distinct procedures to treat sagging skin, so that there are herbal home treatments, anti aging treatments, anti wrinkle lotions, etc.Natural Fixes for Sagging epidermis Apply eggwhites to skin under eyes. A softly massage coconut-oil portions of the skin likely to wrinkle before bedtime. Scrub on the center of pineapple on the face and leave it to get as many as 15 minutes.I recommended you this home remedies for sagging skin, through which you came to know skin tightening home remedies,instantly! site. I am looking forward to the actual commencement of my school research and the complete prep would never have been complete without browsing this site. I simply wanted to thank you very much again. I'm not certain what I could possibly have sorted out without the actual recommendations contributed by you on such a question. for joy. I will be happier for this guidance and then believe you know what a powerful job you have been accomplishing instructing others through the use of a blog. Most likely you haven't come across all of us.